Male (Maldives) – March 28, 2018 (travelindex.com) – Abdulla Ghiyas, President of the Maldives Association of Travel Agents and Tour Operators (MATATO) – one of the most active NGOs in the Maldives dedicated to fostering and promoting the sub industry of local travel agents, is today named as the 2018 PATA Face of the Future. This is the most prestigious honour open to young tourism professionals in the Asia Pacific region. As the 2018 PATA Face of the Future, Abdulla will have extensive exposure at the PATA Annual Summit 2018 from May 17-20 in Gangneung, Korea (ROK). He will be one of the speakers at the PATA Youth Symposium, be interviewed by BBC World News Presenter & Producer Sharanjit Leyl at the one-day conference and be one of the debaters at the UNWTO/PATA Leaders Debate. Abdulla will also be invited to join the 2018/2019 PATA Executive Board as a non-voting member and observer. Abdulla is a young energetic disrupter in the Maldivian tourism industry, who has changed the tourism landscape in the last few years by giving a voice to all Small Medium Enterprises in the industry. MATATO is today considered the leading NGO in the Maldives with the association engaged in various activities such as advocacy and lobbying, training and workshops, fam trips, loan schemes via different financial institutions, recognition programs such as Awards, travel conferences and forums, publications and much more. The association last year organised destination stands and road shows, exhibiting brand Maldives in 14 countries around the world. Abdulla is also a serial entrepreneur engaged in leading travel businesses and startups. He is the Deputy Managing Director of Inner Maldives Holidays, one of the largest inbound and outbound travel agency in Maldives. 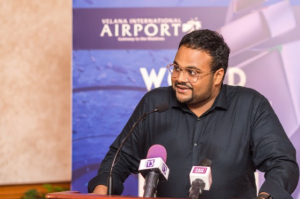 He is also a Director for Ace Travels Maldives and Spence Maldives, which are joint ventures with Sri Lankan blue chip conglomerate Aitken Spence PLC. Having 14 years of experience in the travel and tourism industry, Abdulla was the youngest Board Director of the Maldives Monetary Authority (MMA) from 2014 to 2017. He was also named by the Junior Chamber International (JCI) Maldives as one of the Ten Outstanding Young Persons in Maldives in 2010 for his role in business turnaround in Inner Maldives Holiday. Abdulla also contributes to the Consulate of the Republic of Seychelles to the Maldives as the Deputy.